Today Boing Boing asks the question, "Is it legal for police to shoot photographers in a public place simply because they do not want to be photographed?" Well, no. No it is not. That includes Oakland. 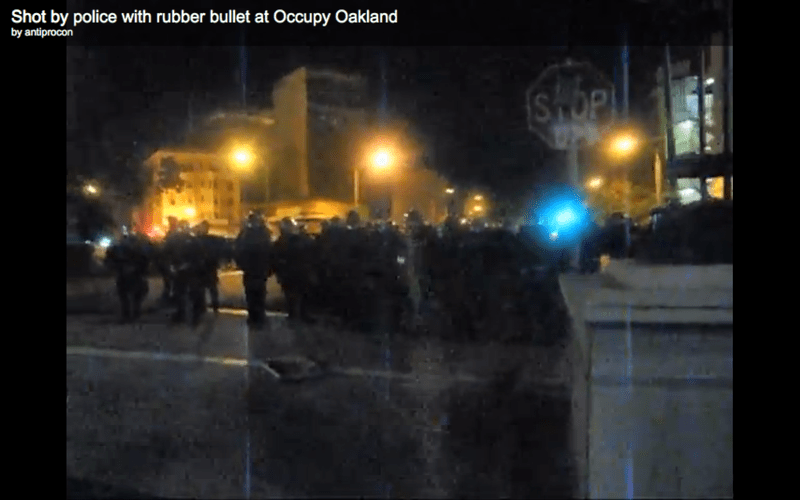 This video, taken by the shootee, makes it pretty clear that everybody is just calmly standing around until (at about :33 in the video), one of the officers suddenly raises his weapon and shoots the guy with a rubber bullet (or possibly a bean-bag round), for no apparent reason. This is illegal. In August, the First Circuit Court of Appeals held that it was unconstitutional to arrest and charge a citizen for taking cell phone video of three officers arresting another guy, apparently punching him in the process. The photographer was charged with wiretapping (seriously), disturbing the peace (really) and "aiding in the escape of a prisoner" (honestly?). The State dismissed that last one on its own, but pressed the other two charges. After they were dismissed, the photographer sued, and the officers raised a qualified immunity defense, arguing that "it is not well-settled that [plaintiff] had a constitutional right to record the officers." Yes it is, said the First Circuit, which had no trouble concluding that there is an established, "fundamental and virtually self-evident" First Amendment right to gather information in this way, and a Fourth Amendment right not to be arrested for doing it in a peaceful and public setting. I'm pretty sure there are cases holding that shooting somebody qualifies as a "seizure," but even if a rubber bullet doesn't count for that purpose (he can still limp away? ), there's still the First Amendment and, here, also the Eighth. It's cruel, even if it is not as unusual as I would have thought.